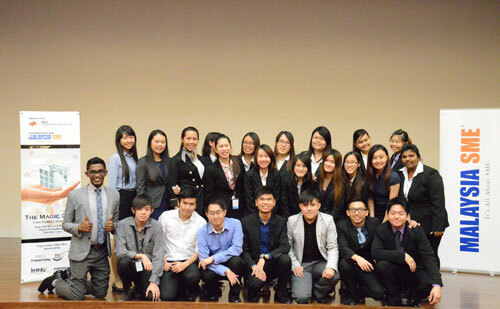 Business degree students at INTI International College Subang (IICS) experienced fun and innovative learning as they displayed exemplary analytical and presentation skills in a case study competition. The Magic Cube 2014 competition, organised by IICS’s School of Business and MALAYSIA SME, saw the participation of students of the University of Hertfordshire and University of Wollongong programmes at IICS. 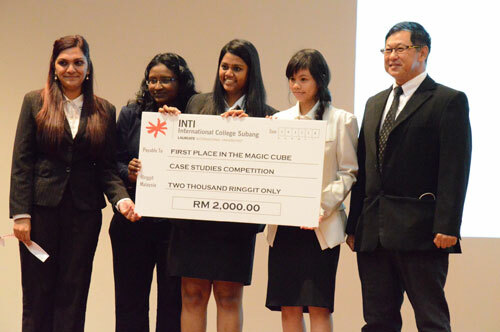 The winning team in the Magic Cube 2014 competition (from left), Pretee Felicia D/O Ragbir Singh, Tharani Venkidasalam, Yogeshwari A/P Shanmogam and Rachel Koh Chung Man with chief judge Dato’ Eric Tai. The qualifying round involving 13 teams took place in early November and the best four teams were selected for the final round, where students had to utilise their analytical thinking, problem solving, research, communication and teamwork skills to prepare and present their case study solution. “The rewards for participating in the Magic Cube were immeasurable as students had the opportunity and privilege to meet and engage with industry leaders including Mr Wayne Lim, CEO of MALAYSIA SME, gain insights into the working and professional world and develop hands-on and relevant skills for the workplace,” said Irene Wong, Dean of School of Business. Group photo of the organising committee. The Magic Cube is congruent with INTI’s aspiration to produce industry-ready graduates with a head start to success as they are exposed to an innovative and industry-focused curriculum that empowers them with career-focused knowledge and abilities. It presents an excellent platform for them to share insights and ideas on economic developments, including the implementation of goods and services tax (GST) in Malaysia. Held in conjunction with the Magic Cube 2014 was a talk entitled “The Practical Aspects of GST” by Dato’ Raymond Liew, Head Office-Managing Partner of McMillan Woods Global, which was open to small and medium-sized enterprises and members of the IICS community.